In case you weren’t too sure about how its new trilogy will fit into the overall canon, the international Terminator Genisys poster has dropped online to remind us that it’s going to essentially hit the reset button. Featuring "The Mother of Dragons" in her new role as Sarah Connor and Arnold Schwarzenegger reprising his infamous character once again (he said he’d be back), our new look at the film is ready to rewrite history. Though, if we're being honest, this one-sheet also is riddled with movie poster cliches. Flames? Check. A Terminator skull? Check. Our two central characters standing close together and looking dramatically off to the side? Check. The Golden Gate Bridge in the background? Check. A tagline to incite "ooh"s and "aah"s? The poster, found via Coming Soon, has it all. 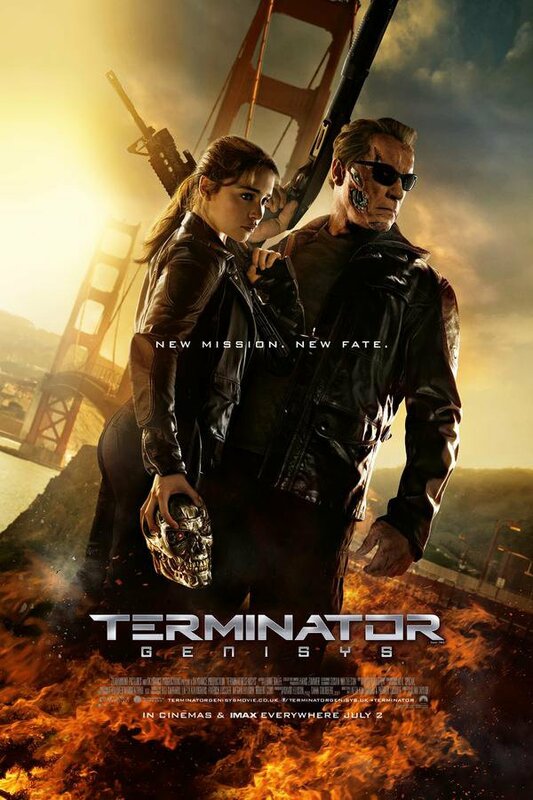 It’s a "new mission" and a "new fate" for the characters of Terminator Genisys. In this version of the franchise, Jason Clarke plays the future John Connor, who is the leader of the resistance and who just so happens to be a Terminator robot, himself. (Check out this poster for confirmation.) He sends Sgt. Kyle Reese (Jai Courteney) back in time to 1984 to protect Sarah Connor and ensure she has a future. But thanks to an unexpected turn of events, the timeline is fractured, which sets up a varied timeline for the films -- and is how Paramount is able to both continue the franchise and reboot it all in one. It’s called killing two Terminators with one machine gun. With this new displacement, it now falls to Reese to set the future straight. Truth be told, it’s difficult to imagine Terminator Genisys earning little at the box office. It hits all the major points of the movie trends in Hollywood right now: remakes, ‘80s/‘90s nostalgia, and action, action, ACTION. Yes, we want it to be good. But unfortunately, the marketing materials aren’t doing this film any favors. Much like this latest Terminator Genisys poster, the images and footage make it look generic, overall, and something worth waiting for the streaming release. However, Emilia Clarke is exquisite in everything she does, and there’s something about watching a CGI Arnold shooting himself like a bullet into a helicopter. Terminator Genisys also stars J.K. Simmons, Dayo Okeniyi, Matthew Smith, Courtney B. Vance and Byung-Hun Lee, and is directed by Thor: The Dark World’s Alan Taylor. The film is one part of a new trilogy and is set for release on July 1.